Villa with a total area of 1100m2 with the house area of 300m2. Single storey villa with Guest accommodation certificate (328 / AL) which gives us license to rent, modern style, ideal to enjoy a family holiday. Situated on the seafront, with enough privacy (enclosed land), only neighbors on the left side, terrace with sea views, beautiful sunsets. 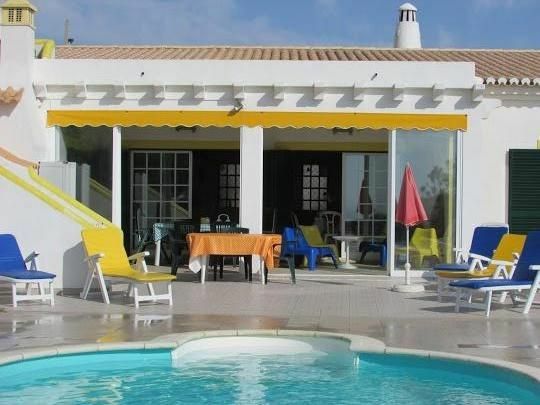 Cottage and beach, situated on the Costa Vicentina. With Internet WI-FI and cable TV (ZON), Satellite TV. House with four bedrooms, a large living room, barbecue, private pool. Around it are the most beautiful beaches of the Algarve, Clerics Montes, Arrifana and Amoreira. In Aljezur in the Municipal Market you can find beautiful daily fresh fish, fruits and vegetables. Bathrooms with windows, equipped with swimwear. Hair dryer available. We have a large living room with a dining table for nine people and two sofas for 6. Pool Table to play that has to pay security deposit plus the rental. Prices depending on the number of people. Signal / input when booking. Delivery of keys by owner. Owner absent during stay. The entrance should be made at 4 pm and departure at 10 am. At the exit the occupants should leave the dishes washed and take out the garbage. The location of the villa is very convenient, with a fantastic sunset on the ocean. It is a 5min drive to the nearest beach (Monte Clerigo). The villa is fairly big and comfortable, the outside areas (pool, etc) are clean. However, as already mentioned directly to the owner, several things urgently need renovation/renewal: bathroom and kitchen fixtures (shower doors and shower curtain rails falling to pieces, very old fridge in both kitchens desperately need replacing, kitchen appliances such as kettle, frying pans, cereal bowls, coffee cups and glasses are either very old, cracked or non-existent). Wonderful villa with a great view! We had a great time in the villa. The location is perfect for a calm stay with a great view on the stunning sunsets. Perfect for families. Very nice saltwater pool…. The house is really very nice and perfectly located. Ideal for big families or even a group. There were 9 people and there were place enough. As main improvements I think one of the bathrooms the small one need a fixing.... is very disgusting to have a shower. The floor of the shower had some holes when we stayed , there was a teppish but it was kind of bad experience to have a shower . We decided to use only one of the baths. Additionally the decoration is very old fashion. There are so menu tiny things everywhere totally unnecessary....that I suggest putting away. Yes the house is large, nice, well located and clean is what all tenants say. Improvements every year. The next year more improvements will do. In the last year we put new sofas new 2 rooms with new beds, lights, lights in the pool, TV, etc. The bathroom! the chower fell and damaged. But we don´t accept the word you say abou the bathroom. proprietária muito simpática, casa com excelentes condições. A repetir sem dúvida! Obrigado pela vossa preferência em escolher a minha casa para as vossas ferias. Inquilinos muito simpáticos,educados e limpos. Inquilinos desejados sempre que o desejarem. Felicidades. Obrigados. follow directions to Aljezur. Then to Vale da Telha and then the properties catch you there (michellin site). The Map from the site it´s very good. Very good beachs and typical restaurants near the sea. Preços dependentes do número de pessoas. Sinal/entrada ao reservar. Entrega das chaves pelo proprietário. Proprietário ausente durante a estadia. A entrada deverá ser feita às 16 horas e a saída até às 10 horas.Na saída os ocupantes deverão deixar a loiça lavada e levar o lixo.